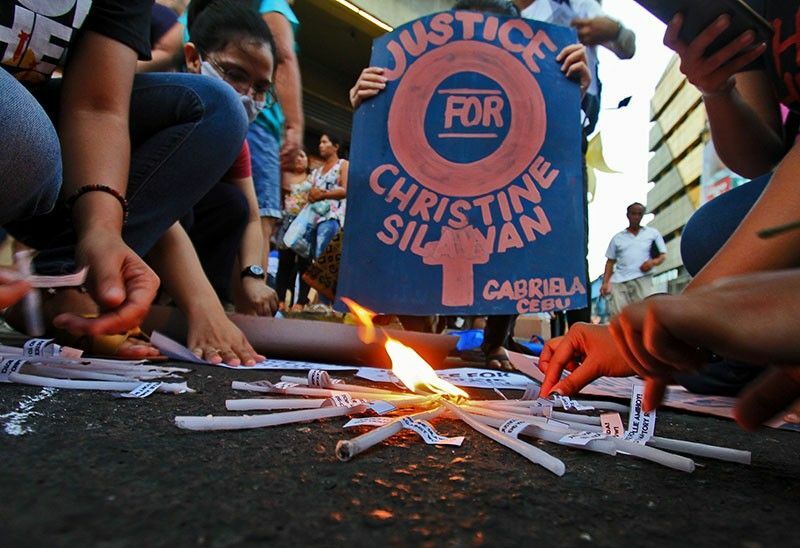 Cause-oriented groups light candles on Colon Street as they demand justice for the death of Lapu-Lapu City student and church collector Christine Lee Silawan. CEBU, Philippines — Jonas Bueno is not a suspect in the brutal killing of 16-year-old Christine Lee Silawan in Lapu-Lapu City, the police in Camp Crame clarified yesterday. The camp’s spokesperson, Police Senior Supt. Bernard Banac, said they arrested Bueno for the killing of a 60-year-old farmer Trinidad Batucan in Danao City, Cebu in January and not in relation to Silawan’s case. Bueno and his brothers Jovie and Junry, allegedly members of a cult, are the prime suspects in Batucan’s killing. Jovie and Junry were killed during a follow-up police operation. Last Friday night, authorities arrested Bueno in Davao City. Police Regional Office - 7 Director Debold Sinas said that while the manner of killing Silawan and Batucan looked the same, there is no evidence to link Bueno to the girl’s death. Silawan was found lifeless at a vacant lot in Lapu-Lapu City on March 11 with half of her face skinned, her tongue cut off, and her trachea and esophagus hulled out. Autopsy showed she died of 20 stab wounds with the wound on her neck being the most fatal. Batucan’s face was also skinned, but Sinas said it is possible that Silawan’s killer is a copycat. Southern Mindanao Regional Police Office XI head, Chief Supt. Marcelo Morales, said the methods by which the two victims were killed are “so similar”. "We are so particular about the method the two victims were killed. They were so similar," he said. But Sinas said Silawan’s killer might just be a copycat and there is no evidence to link Bueno to the girl’s death just yet. "Wala pay evidence. Pwede man nga naay copycat (There is no evidence. He can be a copycat)," Sinas said. Banac also said that they are keeping their investigation on Silawan’s killing under wraps so as not to sabotage the operation against the suspect. Bueno denied the allegations, saying he was already in Davao City when Silawan was killed in Cebu. His co-workers and neighbors in Arroyo Compound in Barangay Matina Pangi, claimed he arrived there two weeks ago. Bueno lived with his live-in partner at Arroyo Compound. Morales said they also need to determine that indeed Bueno was a member of a cult. In a press conference Friday night, Morales said it was a concerned citizen from Davao City tipped authorities about the presence of a man whose face went viral on the social media and was being linked to Silawan’s killing. “Nag-viral ang kanyang picture sa social media and isa sa mga kapitbahay nila nakita yung mukha niya at nai-compare dun sa picture na nag-viral. Kaya yun ang naging reason na tumawag sila at humingi ng assistance based dun sa nag-viral sa social media (His photo went viral on social media and one of his neighbors saw it and sought the help of authorities),” Morales said. Authorities then hatched an operation and swooped down on Bueno who was already using the name Jason Martel.